Mumbai, February 04, 2014: Clunkers, old buckets of bolts, and other wrecks on wheels are the unlikely “stars” of Last Car Standing, a new high-stakes, high-impact automotive series that pits the proud owners of lousy cars against each other in a sequence of escalating driving challenges. Why? For the chance to restore their ride to its original glory! Premiering on February 10th, Discovery Turbo’s new competition series Last Car Standing puts five drivers through four high-impact elimination rounds until there is a sole car-vivor. The stakes? The driver of the last car standing gets a $10,000 upgrade. Or, they can pass on the ten grand for a chance to compete in a playoff episode for a complete $50,000 automotive resurrection! Hosted by Christian Potenza, renowned Canadian actor (of SIDEKICK, TOTAL DRAMA fame), each episode of Last Car Standing features five diverse and fun-loving drivers – each trapped in a love-hate relationship with an embarrassing clunker – who put it all on the line through four brutal rounds of competition until only one last car is standing. Last Car Standing will air Monday to Friday at 10 pm starting February 10th. 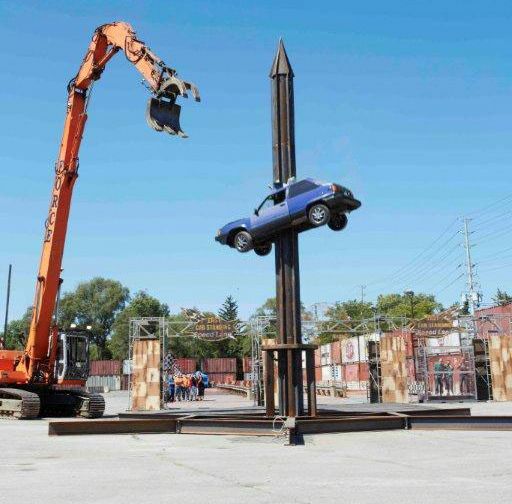 One by one, each eliminated driver must watch as their beloved beast endures the ultimate humiliation of being impaled on the massive Spike of Shame. But the driver – and the car – that withstands the grind of competition at the end of each episode gets a $10,000 automotive upgrade and best-car bragging rights…or… the chance to return for the Grand Finale to compete against other champion beaters for a $50,000 “better-than-new” vehicle restoration and the title of The Ultimate Last Car Standing. In each episode, cars are grouped according to class, from rusty old “Boats” and sub-standard Subcompacts, to faltering 4x4s to rundown Vans. At one point in time, each of these cars was a pristine showroom beauty, but over the years, these once-perfect automobiles have been allowed to fall apart. Each group is put through four elimination rounds until there’s just one motor still running. The challenges start with a race around the treacherous Hot Lap; then on to a gruelling climb, tow, or launch up LCS’s giant adjustable hydraulic ramp. Next, it’s a head-to-head-to-head battle up and down (and over and around) on the dreaded Drag Strip Challenge; and finally the Beater Buster showdown – the ultimate, punishing, automotive obstacle course designed to push each car’s capacity to its breaking point.